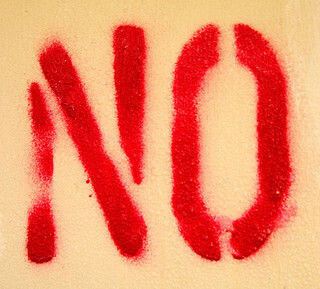 The No’s and Yes’s of the Christian faith | The Old Adam Lives! I know some really nice folks, many of whom are Christians. But some of them tell me that they are working on some project, such as not eating or drinking certain things. Or not doing certain activities, which will then bring them “closer to God”. There is a great focus in their places of worship on ‘what we do’, or ‘what we ought not do’. No matter how much gospel they receive, the message always seems to get back to them, and what they should, ought, or must be doing to achieve a closer relationship with God. They lack an understanding of the true nature of the human being. They lack the understanding that we are ‘bound to sin’. They have the opposite and false assumption that we have “free-will” when it comes to matters of faith. And they lack an understanding about God’s real presence in the external Word and sacraments. No real presence of Christ in Baptism and Holy Communion, then it will inevitably all turn back onto you, and what ‘you do’, or ‘don’t do’. There is no relying on Christ’s finished work. There is no assurance. There is no freedom. In essence these folks, God bless them, may as well be Roman Catholics (some are). For in the end, Christ’s work on the Cross is good, and nice, and a great example, but there still remains some things that I ”need to do’, as well. NO to the proposition that we need to add something to His Cross. NO to the chorus of well-meaning Christians who would put us on the ladder up to God, also. NO to those folks who believe that we carry within ourselves some spark of goodness that just needs to be set in motion to get us onto the proper path of sanctification. NO to the belief that Christ is waiting for us to do our part. But we do say, ‘YES’! Yes that Christ is our All in all. Yes that Jesus loves the ungodly, the kind of ungodly that we know we are. Yes that everything needful for our justification and sanctification has been done, is being done, and will yet be done…by our Lord, Jesus. And YES, that this free gift is given without any strings attached for ALL people. That they might hear, and by God’s grace believe that this is true. Thanks to flickr and Thomas Hawk and erix!, for the photos. This is great, Steve! I hope I can figure out how to get it on Twitter. Why don’t you tweet it to me @trudi4truth and then I will retweet it. I haven’t tweeted for a long time. It may take me a while to find my passwords (or whatever) and get it to you. But I’ll try. I suppose it is good to wrestle with these kind of questions. 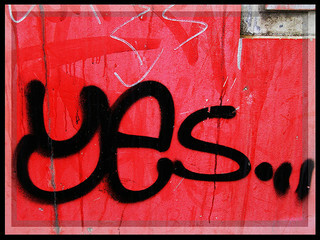 For my part, I am satisfied to say YES to all those things to which you say YES, and to also say YES to those things and folks to which and whom you say NO. We try, for the sake of the pure gospel and the freedom for which Christ has set us free, to say NO to all add-on’s to Christ and His Cross. We don’t believe that the folks who are into religious ascension or spirituality projects are not Christian. We would never say that. But we believe that it is Christ Jesus and what He has done for sinners, that sets us free. And that it is enough. And we believe that Christians who are under the yoke of the law (what we should, ought or must be doing) are under a tremendous burden. And since we have been set free from all of that, we desire that others might hear it, also. And experience that great joy and freedom from relying totally on Him.